When World War II ended, no industry was stronger or more important than American steel. But over the last 60 years, the industry has suffered a steady decline, becoming less competitive and far less central to the US economy. Immediately after the war, the global demand for steel was more voracious than ever. Mills owned by foreign competitors had been devastated by the bombings. Cities in Europe and Asia needed to rebuild, and American cities were growing rapidly as well. Demand for new cars was great, and the Interstate Highway was under construction. 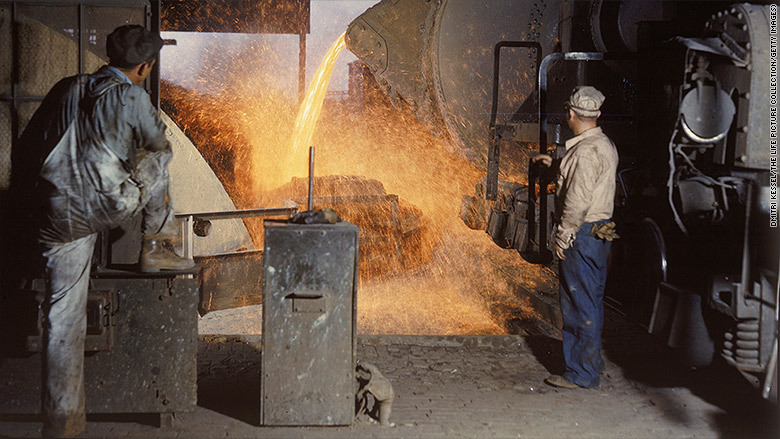 America's steel mills were producing steel at a furious pace, making more than half the world's steel in the late 1940s, and about 40% of the world's steel throughout the 1950s. In the 10 years starting in 1948, American steel mills averaged nearly 700,000 workers. Today only 83,000 people still work in the nation's steel mills. Part of that decline is due to much more efficient processes. The basic oxygen furnaces and continuous casters now in use can make steel using a fraction of the work, energy and manpower required by open hearth furnaces the industry used during its heyday. Additionally, much of the steel produced today comes from recycled scrap, as opposed to using the more expensive and complex process of turning iron ore into steel. In fact, the biggest steelmaker in the United States, Nucor (NUE), uses recycled scrap. It started with a single minimill in 1969. "Nucor did more to kill traditional American steel production than the Chinese ever did," said Stephen Mihm, a University of Georgia history professor who specializes in the history of business. Two steelworkers at Alabama's Birmingham Steel Company in 1942. But Nucor wasn't the only problem. Foreign competitors in Europe and Japan were much faster to adopt more efficient technologies after World War II, giving them an edge. Making matters worse, Mihm said, the United States was reluctant to change its ways, giving the mills overseas an even bigger advantage. "Neither labor nor management were thrilled about the idea of spending the capital to switch to basic oxygen furnaces," He said. "But labor wasn't the one making the capital investment decisions. It's ultimately management that dropped the ball." But others say that US efforts to help Europe and Japan rebuild after the war gave foreign competitors a big advantage by helping to lower the cost of capital those steelmakers needed to rebuild. "We basically gifted steel industries to Germany and Japan," said Scott Paul, president of the Alliance for American Manufacturing, a public interest group supported by both the Steelworkers union and leading manufacturers. "Blaming the American steel industry, I'm not so sure that's fair." Then came the industrialization of China, which led to a boom in the steel industry there unlike anything since the industrial revolution. China's steel production went from a third of the output of American mills in 1981 to match US production only 12 years later. It's posted an 800% increase in production since then. Today China's steel industry produces roughly half the steel in the world, according to World Steel, a global industry trade group. American mills produce less than one tenth the volume of China. 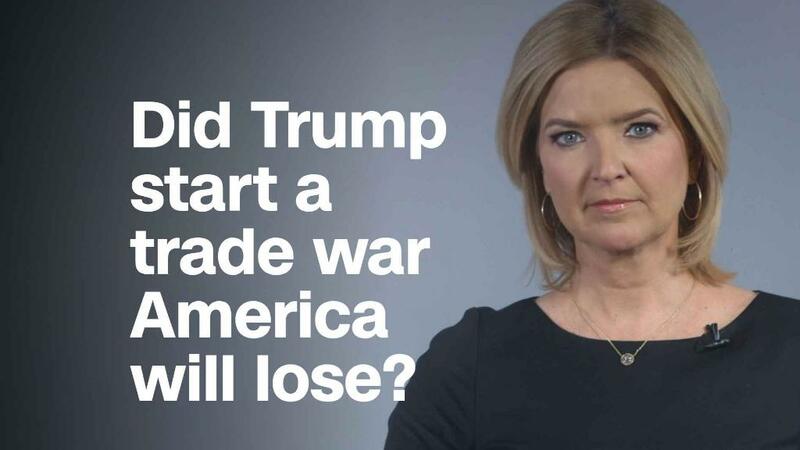 And while much of that production is used by Chinese auto plants and construction, there is no question that there are massive amounts of Chinese steel exports driving down prices around the globe. "China has a lot of zombie steel mills turning out steel that no one needs," said Paul. "It's unbelievable how market distorting it is. In a labor intensive industry like steel, that means closing mills and layoffs." At the same time that foreign steelmakers became more competitive, the US economy shifted away from manufacturing goods, and became centered around providing services. The growth of industries like banking, media and much of the tech sector, helped push steel aside. To mark the end of an era, U.S. Steel (X) was dropped from the Dow Jones industrial index, a list of the nation's most powerful companies, after 90 years in 1991. Disney (DIS) joined the index at the time, as did JPMorgan, which is ironically a Wall Street firm named for the founder of U.S. Steel. Bethlehem Steel, was the last steel company to fall out of the Dow in 1997, when Walmart (WMT), Hewlett-Packard (HPQ) and Travelers (TRV) insurance were added in.